Start your group. Meet your tribe. We provide the platform. Just be down to meet. We know how it feels to meet people and find friends who share your passions, speak your language, or ask the same questions. Your tribe. Your squad. Your people. That’s why DownToMeet built a platform to organize, find, and attend group events. We empower organizers with all the tools they need to build and organize groups and events. If you're down to meet awesome people, build a community, or find friends, then you belong here. Our system provides tools to help you organize and maintain local groups and events. We are group-centric; we know that events belong to groups, not to DownToMeet. Use a screen name to communicate with the world while knowing that your real name and email address are securely encrypted and will never be shown to anyone. Built on a secure platform with infinite scalability for whether you have 50, 500 or 50,000 users. We’ve designed the site to minimize the learning curve. Everything you would expect to find to help you organize and manage groups and events is here (along with extra perks). Personalize your group and events to stand out. Use links and photos in the event description. Customize fonts and colors. Create public, private or closed groups. Host public or private events. Your privacy is our first priority. This site is organizer-centric. Our new feature development is guided by you, the organizers. You can weigh in on the new functionality we develop. 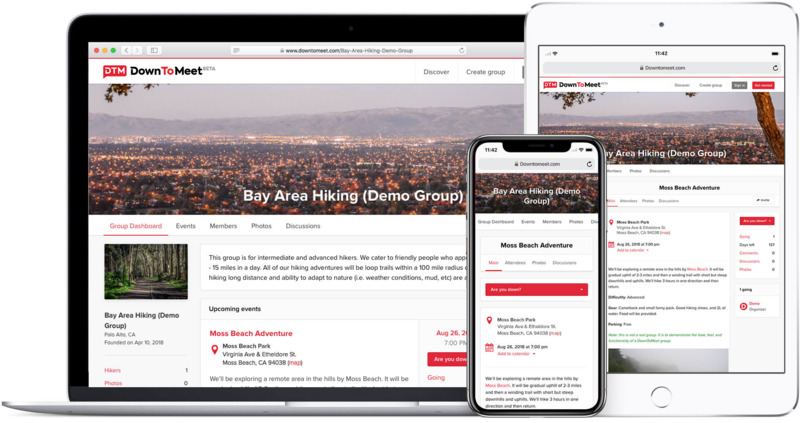 Create as many events as you like, ask questions with RSVPs, use waitlists, get automatic notifications, take attendance, communicate with members, use discussion boards, and more. You have full control. Upload photos to event albums without losing quality. Get people talking with likes and comments. View events conveniently on your computer or smartphone. No app required! This site is for everyone. Choose from thousands of interests to find local like-minded people and groups. If you received an invitation to attend a group event, just click “Are you down?” to RSVP. You’ll be asked to sign up for DownToMeet and the event. Please remember to stay safe. Never go to unfamiliar places alone and always check where you’re going ahead of time. Searching for events to join? 1. Sign up for DownToMeet. 2. Fill out the Interests page on your profile. 3. Find local events or wait until we notify you of a new group in your area matching your interests. Either way, FOMO ends here. We are delighted to have you here! DownToMeet has been designed with you in mind. To get started, sign up for DownToMeet and click on "Create Group" from your account menu. If you are an existing group organizer coming from another site, you should find yourself in familiar territory. Welcome to your new home! Welcome to DownToMeet! Are you down to meet? Curious? Find groups and events here.